A soldier with PK machine gun. DPR. 2016. The leader of the Donetsk People’s Republic (DPR) Aleksandr Zakharchenko said at a press conference on January 11 that the DPR army was ready to fend off provocations of the Ukrainian army, RIA Novosti reports. “The situation is complex; it is one that precedes battle. If the weather stays like this, around minus 5 to 10 degrees [Celsius], for a week or two, provocations from Ukraine can be expected. Before, the weather prevented them from organizing any provocations, but now they will be able to do so,” this is how the leader of the DPR assessed the situation. He also noted that the tense situation in Kiev encourages Poroshenko to unleash a full-scale war. He believes that this is indirectly supported by the more frequent shelling at the demarcation line. 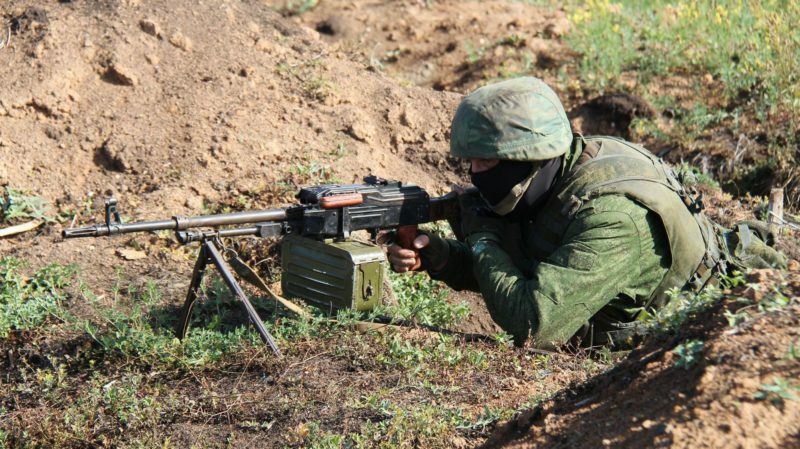 Units of the Ukrainian army started violating “the New Year ceasefire” as soon as on January 8. First, they used only mortars, small arms, infantry fighting vehicles, and rocket launchers; today they have used artillery. This entry was posted in News from Ukraine and tagged Aleksandr Zakharchenko, Classical War, DPR, Ukraine. Bookmark the permalink.